Chris Matthews on Thursday accused Sarah Palin of aiding and abetting Pastor Terry Jones, the man threatening to burn Korans on Saturday's ninth anniversary of 9/11. For days, Matthews and his colleagues on MSNBC have been calling upon Republicans to speak out against Jones. On Wednesday, the former Alaska governor did exactly that at her Facebook page and at Twitter. But this wasn't enough for Matthews who repeatedly on the 5PM installment of "Hardball" attacked Palin for being too "soft" in her admonishment of Jones, and actually accused her of giving the Pastor the linkage between burning Korans and the controversy surrounding the Ground Zero mosque. CHRIS MATTHEWS, HOST: Democratic strategist Steve McMahon joins us now, along with Republican strategist Leslie Sanchez. You know, this is one of those moments where, OK, I`m going to take you on, Leslie, here. Ready? LESLIE SANCHEZ, REPUBLICAN STRATEGIST: All right. MATTHEWS: I think that people like Boehner and Sarah Palin are the first people in the news cycle to put out the word there`s some linkage between burning the Koran on national -- international television and the mosque a couple blocks away from the World Trade Centers. MATTHEWS: And now these people down there, this minister, discovered, hey, this is handy. I will trade one for the other. It turns out the trade wasn`t real, but at least he`s pretending. Your thoughts about accomplices before -- accessories before and after the fact here. SANCHEZ: I think that`s a stretch. MATTHEWS: Why is that a stretch? MATTHEWS: Have you ever heard these ministers talk about a link with the mosque before Mr. Boehner or Sarah Palin mentioned it? SANCHEZ: Well, I don`t read everything with the mosque. But let`s look at the realities. You have got 50 people in a garage that say these crazy things and, all of a sudden, we have all the networks, the president, and everybody responding to them. Look at it for what it really is. MATTHEWS: So, is Sarah Palin one of the 50 crazy people in the mosque, or what? SANCHEZ: I think what is interesting is that Sarah Palin is brought up again. She puts a tweet out there. She starts talking about it, and everybody wants to say she has directed and shaped this debate. 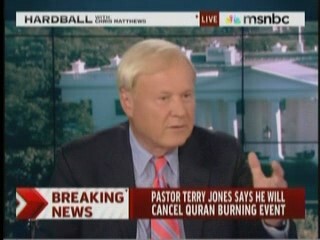 MATTHEWS: "People have a constitutional right to burn a Koran if they want to, but doing so is insensitive" -- I would say it`s more than insensitive -- "and an unnecessary provocation." That`s pretty soft language compared to the way she talked about the mosque. Book burning is antithetical to American ideals. People have a constitutional right to burn a Koran if they want to, but doing so is insensitive and an unnecessary provocation - much like building a mosque at Ground Zero. I would hope that Pastor Terry Jones and his supporters will consider the ramifications of their planned book-burning event. It will feed the fire of caustic rhetoric and appear as nothing more than mean-spirited religious intolerance. Don't feed that fire. If your ultimate point is to prove that the Christian teachings of mercy, justice, freedom, and equality provide the foundation on which our country stands, then your tactic to prove this point is totally counter-productive. Our nation was founded in part by those fleeing religious persecution. Freedom of religion is integral to our charters of liberty. We don't need to agree with each other on theological matters, but tolerating each other without unnecessarily provoking strife is how we ensure a civil society. In this as in all things, we should remember the Golden Rule. Isn't that what the Ground Zero mosque debate has been about? MATTHEWS: It`s insensitive? We have a travel alert. SANCHEZ: But why pick out Sarah Palin? I guess that`s my point. MATTHEWS: Because I`m looking at the news that came in this morning. And, all of a sudden, she`s getting her fingers into this thing. I think it`s incredible that she would be so soft -- taking such a soft line on this guy burning the Koran, because you never attack to the right when you`re on the right. That`s what I think is going on here. Excuse me! Matthews and his network have been criticizing Republicans for not speaking out against this guy. Now that some have, he accuses them of aiding and abetting the Pastor! SANCHEZ: But for what political purpose? That`s what I`m saying. MATTHEWS: -- with as far out, with as far out with the fringe as she can, because that`s her base. MATTHEWS: You can`t hurt by being friendly with the right. MCMAHON: --. base of the Republican Party. Exactly. You cannot be too far right, because especially if you`re thinking about running for president or if you want to have a controversial talk show on FOX, you need to do these things. And they generate headlines. They get people like us talking. And it works for Sarah Palin, who wants to be an entertainer and a provocateur. I`m not sure it works very well if she wants to be the president of the United States. The hypocrisy on display here was astonishing. For weeks, folks like Matthews have been telling the American people that the backers of the Ground Zero mosque have a Constitutional right to build it there, and this supersedes the public's overwhelming opposition. By contrast, the conservative position has been to recognize the Constitutionality in play while questioning the wisdom of doing something that would offend so many Americans. As such, Palin - and Boehner as you'll see in a bit - were making the exact same argument concerning Jones: he has the right to burn these Korans, but they wish he wouldn't. Not only didn't Matthews see the consistency in these positions, he was the one being inconsistent by now claiming Jones's Constitutional rights were irrelevant and represented a "soft" position on Palin's part. SANCHEZ: First off, I`m not going to put Sarah Palin`s words in my mouth. Let`s put it that way. SANCHEZ: I can speak for myself. But I will say this much. I think you play too much into this game that Sarah Palin wants you to do, which is -- talking from a conservative Republican perspective, I think we were very clear, both bipartisanly, from a bipartisan perspective, of how people felt about how ludicrous his statements were and his actions to be. SANCHEZ: The reverend in this case. SANCHEZ: And I think why can`t we talk in solidarity about that? MATTHEWS: I just want to know -- I will go back to my question -- why did she throw him the life jacket and say, put this on, tie it to the mosque? Why did she do that? Why did Boehner do that? Nobody else was doing it in the media. I wasn`t drawing the connection. MATTHEWS: These characters were sitting, were on the show right here, talking to me, both these pastors, Sapp and Jones -- neither one of them mentioned the mosque. Both long interviews. I said, is there anyone who could appeal to, we could appeal to you to stop this? Or any -- nobody mentioned the mosque until today, after these stories moved by your -- people on the far right. Not on the right. People like Boehner, just a Republican golfer. SANCHEZ: Well, the tan is important. But to be fair to that point, I think a lot of people were talking about it. If you want to see that`s a lifeline, I think you`re going to see it regardless of anything that I have to say. MCMAHON: -- from the majority of Americans who feel differently about this. MATTHEWS: There`s a big difference between the difficult question of building a mosque a couple blocks from the World Trade Center, which I`ve always said on this program is a difficult question. I`ve admired Michael Bloomberg for the courageous position he`s taken given the fact of his job up there. But I think there`s two sides of that argument. Can we agree there`s no two sides to the argument about burning religious books on world television? Can we agree on it? MCMAHON: Yes. Yes, we can agree. MATTHEWS: OK. We just got the word that Gates -- Secretary Gates did make a call to the reverend to try to smooth this thing out or end this thing. Maybe that was influential. Here`s John Boehner making the point I was trying to relate to here, conflating -- there`s a word I don`t like, but it`s big these days on the right -- conflating Koran-burning with the Islamic center near Ground Zero. REP. JOHN BOEHNER (R-OH), MINORITY LEADER: To Pastor Jones and those who want to build the mosque, just because you have a right to do something in America, does not mean it is the right thing to do. MATTHEWS: That was healthy. We call that in the NBA, an assist. MATTHEWS: That`s called an assist. MATTHEWS: Or an alley-hoop actually. MATTHEWS: Get it near the top of the rim so the other guy can put it in. I ask you: do you need a better example of liberal media bias? Matthews and his colleagues complain for days that Republicans aren't doing anything to stop Jones from burning Korans on Saturday. Two top GOP figures do, and they're accused of helping the Pastor. Makes you want to throw your television set out the window, doesn't it?